First up was Sam Sampson in the men’s -79kg category. Sam defeated Bulgarian and Greek judoka with swift ashi waza and fast ne-waza on his way to the final whereby he scored a wazari against a Greek judoka, later finishing the Greek off with a hold down to secure the gold medal. Sam Charalambous was up next in the men’s -75kg category. 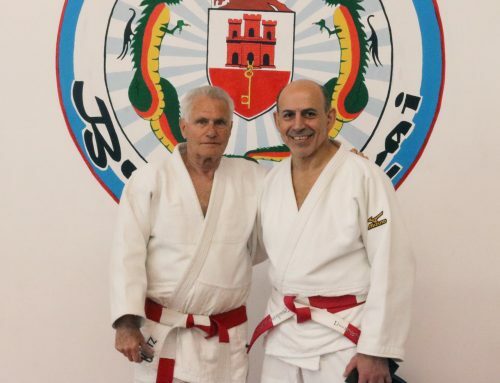 Sam started his day off well, defeating a Greek judoka by wazari. Sam unfortunately lost his following fights against a Bulgarian and Greek, leaving him with the Bronze medal. However, redemption was certainly on the cards as Sam Charalambous later entered the open category and managed to execute some superb throws and hold downs in order to take the gold! 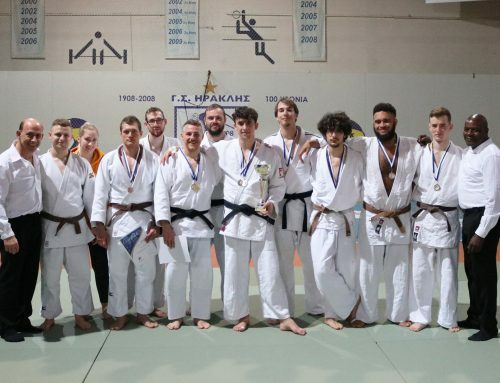 In addition to this, Sam was later awarded his 2nd Dan due to his technical prowess and string of impressive domestic and international performances, which includes a bronze medal at the CSIT World Sport Games last week! Following Sam, the JFAUK ladies, Hannah Chesham and Lucia Pascali took to the tatami. Hannah and Lucia both worked their way though their category, both using fantastic ne-waza and big hip throws before meeting one another on the semi-final. Hannah managed to secure the win this time, leaving Lucia with a well deserved bronze medal. Hannah went off to face a Bulgarian judoka in the final, and Hannah spared little time securing a tight juji gatame to take the gold. The ladies weren’t finished just yet as they then entered the open category, however both fell short to a much heavier woman, with Hannah taking the silver, and Lucia taking a second bronze. It was the turn of Ross Elliot next, in the men’s -100kg category. Ross made light work of his opponents, executing big throws in his way to the final. In a repeat of the Miyazaki cup final earlier this year, Ross faced the same Greek judoka, however quickly executed a cross grip Osoto Gari to take the gold. Alex Charalambous stepped back on to the international tatami for the first time in four years next in the men’s -68kg category. 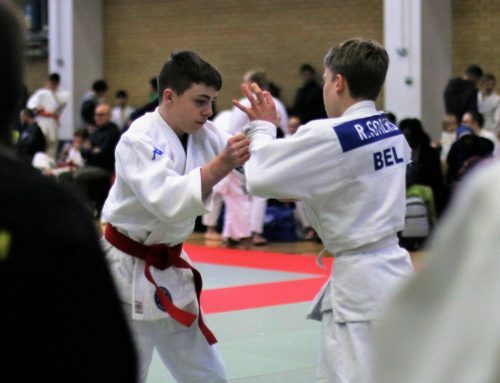 Alex started his day with a fantastic Uchi Mata before dispatching the rest of his opponents on the way to the final. 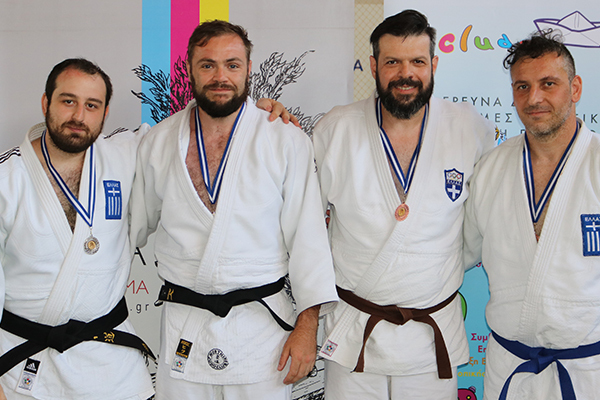 There, he faced an experienced Greek judoka in a fight that went the distance, however the Greek managed to take the win due to a very close wazari score earlier in the match, leaving Alex with a silver medal. Alexis Bardini then made his way into the contest area in the men’s -71kg category, facing an all Greek pool. Alexis used excellent ne-waza to finish his opponents in order to earn his place in the gold medal match. There, he executed a dynamic cross grip Tai Otoshi to secure his gold medal. Finally, Adam Brown made his international debut in the men’s +100kg category, taking home the gold medal. Not satisfied with just one medal, Adam then entered the Open category and ended up fighting his way to a Bronze medal against experienced opponents.